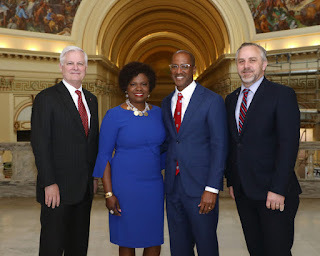 OU President James Gallogly, Davia Stevenson, Eric Stevenson, and Senate President Pro Tempore Greg Treat. OKLAHOMA CITY – The Senate Education Committee in an unanimous vote on Tuesday approved the nomination of Eric Stevenson to serve as the next member of the Board of Regents for the University of Oklahoma. The nomination was carried in committee by President Pro Tempore Greg Treat, R-Oklahoma City. “As an alumnus of the University of Oklahoma, I’m proud to carry the nomination of Eric Stevenson to the OU Board of Regents. I’ve never carried an executive nominee more qualified for a post than Mr. Stevenson. I’ve gotten the chance to know him through the confirmation process and find that he is qualified, capable, and carries a real passion for the University of Oklahoma. I know he’ll do a great job leading OU to achieve even greater success," Treat said. Stevenson was nominated to the post by Governor Kevin Stitt. Stevenson serves as the senior vice president of retirement plans distribution at NationWide. He earned a bachelor’s of business administration in finance from the University of Oklahoma and a master’s degree from Northwestern University Kellogg Graduate School of Management.